Hobbyists and farmers alike have a need to keep their vehicles charged and ready to use at a moment’s notice. Whether they’ve been sitting in the garage over the winter, or they haven’t been needed until harvest season, you can ensure that the batteries are in perfect working order and are ready to go when you are. The manufacturers of the NOCO GEN4 Genius Black know that vehicles are important to farmers, hobbyists and car enthusiasts alike. That’s why they designed this 4-bank charger to handle up to four 12-volt batteries at once. The small, lightweight charger may seem compact, but it is designed to do its job exceedingly well. Thanks to smart technology, and an even smarter design, the NOCO GEN4 Genius Black can charge batteries up to two times faster than the more traditional linear chargers. The VosFX processor is designed to constantly monitor the power input, the charger itself and the attached battery. There is no risk of overcharging or battery damage; thus, your battery is assured a longer life and improved capacity. The charger is designed as a ‘set it and forget it’ piece of equipment. Just plug it in and let it do its job. The smart processor will adjust the input and output levels as necessary in order to ensure your batteries are charged to their maximum capacity. 1) Voltage Check: The charger checks the battery’s voltage and ensures the condition is stable and that the connections are in order. 2) Bulk Charge: This starts the soft-charge process. 3) Continuation of charge: The battery is then charged to an approximate level of 80%. 4) Absorption: This is the final stage in the charging process; the levels are maintained to a pre-set number. 5) Analysis: The charging is suspended and the voltage is checked. 6) Recondition: A constant charge is sent to the battery, typically a maximum of 15.7 volts. 7) Float: The constant voltage is maintained. 8) Pulse/Maintenance: If the voltage dips below a certain level, the battery is injected with an electrical current. This ensures your battery is always in perfect running condition. The NOCO GEN4 Genius Black was designed with all of the current U.S. and international safety standards in mind. There are several built-in safety features that will protect the user and the battery including protection against reverse-polarity, open circuits, short circuits, overheating, sparks, overcharging and abnormalities. Whether the user is a novice or a professional, they are well protected when working with the batteries and chargers. For watercraft including small boats and jet-skis, there is protection against the harsh elements that can make it difficult to charge on-board. This unit features a waterproof housing that is fully sealed, making the charging process much easier and safer. The ingress protection rating is IP68, and all marine standards are met. The NOCO GEN4 on-board charger comes equipped with a fully sealed, waterproof encasing that makes it well suited for harsh environments. The ingress protection rating is IP68. It also meets ISO 8846 marine standards and U.S. Coast Guard Title 33 CFR 183.410 ignition-protection requirements. This makes it portable, and yet sturdy enough to handle tough jobs and weather conditions. Accessories for the NOCO GEN4 Genius Black charger include an on-board charger inlet, and a cigarette lighter socket, that is marine grade. Other items that consumers bought along with this product are extension cables and marine fuel stabilizers. The 4-bank, 40 amp charger unit can simultaneously charge four 12-volt batteries. The advanced safety features mean that anyone can use this charger with little to no risk of injury. The charger will support multiple battery types including AGM, wet, gel and MF. The 8-step charging process ensures that your batteries are charged in an efficient manner, and that they stay charged for when you need them. The housing is fully sealed and waterproof, making it perfect for watercraft, in rough environments. The NOCO GEN4 Genius Black charger is ideal for those who own multiple pieces of farm equipment or recreational vehicles, including cars, motorcycles, jet-skis, and snowmobiles. The three year limited warranty is not transferable and only protects against manufacturer defects and workmanship. It is not meant to use as jumper cables, so a quick charge is not feasible. Many of the consumer reviews are raving about this unit, both on the Amazon website and on other independent sites like Overstock.com. The biggest benefit that consumers are raving about is the ability to charge four batteries simultaneously. They also love the safety features and the smart technology. Many of the customers who bought this charger are those who own recreational vehicles that sit idle during the week. They are happy that they can plug in the charger and be assured that their ‘toy’ will work on the weekend for them. 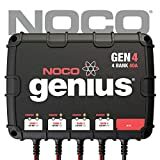 At the time of this review, the NOCO GEN4 Genius Black charger was available from various online retailers for a price of $190 or more, and it is available to select countries outside of the U.S. The NOCO GEN4 Genius Black charger is a valuable piece of equipment for those who have vehicles that don’t get used every day. It offers state-of-the-art technology and good value for the price. You’ll never have to worry about your vehicle not starting up, no matter how long it’s been since you’ve used it. Take a look at our car battery charger reviews here for more choices.